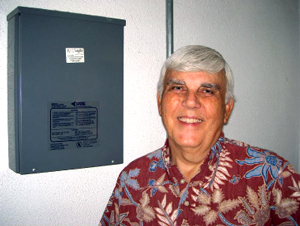 Clarence Fuqua contacted Brayden Automation in 2006 to inquire about a demand control device for his HOA's laundry rooms. Clarence is a resident of Mutual Eight in Leisure World Seal Beach, California, a senior citizen community of approximately 9,000 residents. Groups of residential units are organized into "Stock Cooperatives" (mutuals) similar to a HOA. Each mutual operates one or more laundry rooms. 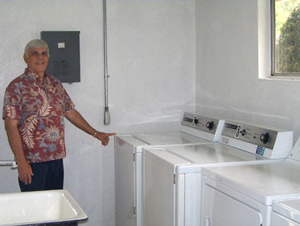 Each laundry room is typically equipped with 6 washers, 6 dryers and two electric water heaters. The laundry rooms' demand had exceeded 30kW requiring them to be moved to Southern California Edison's GS-2 (commercial) rate. On the GS-2 rate summer peak demand is billed at approximately $32.00 per kW making it one of the highest demand charges in the USA. By keeping the demand below 20kW, the laundry rooms were returned to the GS-1 (residential) rate which does not contain a separate demand charge. "Energy Sentry has been a lifesaver here for the residents. Most residents here live on fixed incomes and reducing costs is a benefit to everyone." "They're a breeze to install"
Seven additional Leisure World mutual associations have now installed an Energy Sentry Model 9388B in their laundry rooms and savings have been approximately $4,400 per year (Mutual Eight has solar so their savings are $8,800 per year) by keeping below 20kW and on the GS-1 rate. This is about a 40% reduction compared to what they paid the previous year. "Energy Sentry has been a lifesaver here for the residents. Most residents here live on fixed incomes and reducing costs is a benefit to everyone," says Clarence. Leisure World's service maintenance department has installed the systems. "They're a breeze to install," said two of the electricians on staff at Leisure World. Based on the success of the demand control systems in the laundry rooms, Leisure World has begun to deploy the systems in other buildings. An administration building was installed two years ago and the swimming pool facility was installed in late 2009. "All in all, the demand controllers have been great and have saved us a lot of money," says Ruben Gonzalez, Service Maintenance Department Supervisor. We're happy to add Leisure World to our long list of satisfied clients. If we can help you to reduce your peak demands and cut your electric costs without sacrificing comfort or convenience, give us a call today!